When I travel — which happens far too infrequently for my taste — I focus on the food. That’s probably not surprising. The problem with falling in love with the food of a place that, due to a lack of funds or time I won’t be visiting again in the near future, is the cravings. Sometimes after barely a week has passed I’m already desperate to be back where I was eating those foods I just can’t get in Minnesota. My coping mechanism is cooking: when the appetites first awakened by travel arise again instead of buying a plane ticket I head to my kitchen and do my best to recreate those foreign flavors at home. It’s been a year since Martha and I traveled to Colombia and discovered the magic of Empanadas de Pipián. I’ve eaten plenty of empanadas in my life, many in restaurants in in Minnesota, but none like these. 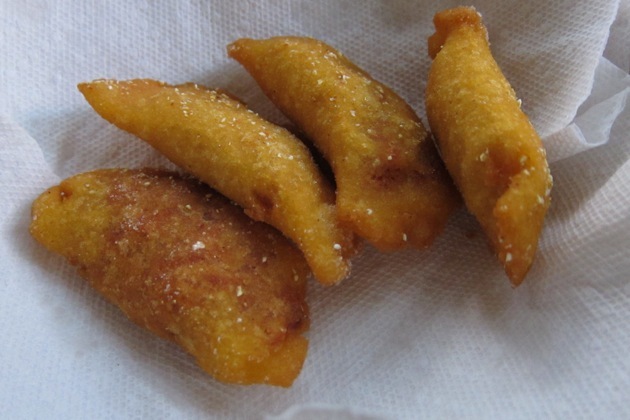 Empanadas de pipián have two distinguishing characteristics: first, the texture of their shell. Nobody would ever compare empanadas de pipián to Cornish (or Upper Peninsular) pasties; empanadas de pipián have a crisp, crunchy shell, reminiscent of a hard taco but slightly more yielding. The other unique characteristic of empanadas de pipián is their flavor: peanuts. While some empanadas may feature meat, or olives, or a medley of any number of ingredients, empanadas de pipián taste like peanuts. In a good way. A uniquely Colombian treat. When a Colombian food jones strikes, the first reference I consult is the brown notebook I transcribed during afternoons and evenings spent in Martha’s Aunt Stella’s kitchen in Cali, Colombia as she prepared the family’s meal and put up with my persistent questions about her technique and ingredients. Stella is my sage for many Colombian foods. As a resident of Cali, however, Aunt Stella has easy access to the nationally-renowned empanadas fried up at El Zaguán de San Antonio. Being able to drive 15 minutes to eat some of the best empanadas in town (in the whole world, in fact), she didn’t have much reason to make them at home while we were there. So the brown notebook had no recipe for me. Where the brown notebook fails, the the two volume Nuevo Gran Libro de la Cocina Colombiana (originally published by Círculo de Lectores in 1983 and reissued by Intermedio in 2008) that I bought in Cali usually has some guidance. This cookbook covers a great variety of Colombian dishes, from soups to desserts, and does a good job of treating the regions of Colombia, even in its brief form. The photos are beautiful. 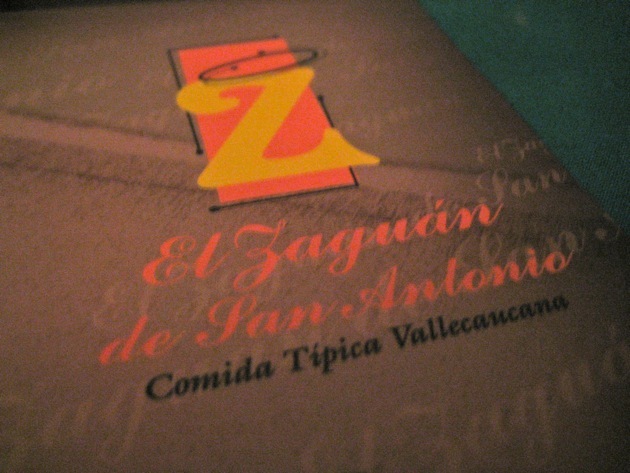 But while it contains several recipes for empanadas, El Gran Libro was silent on the subject of those of pipián. With first-hand experience coming up blank and my published reference of no help either, I had to turn to my absolute last resort when it comes to cooking: the Internet. That might sound odd coming from a food blogger, but my experience of Internet recipes largely mirrors that of grumbling old-media editors: there’s a lot of crap to sift through (all the recipes I post on marthaandtom.com are perfect, of course). There are a few websites whose recipes I will trust outright, but for the most part searching the web for recipes requires sifting through several versions on various websites and then applying a little common sense and experience to try to get something workable. A search turned up several recipes which I used as to develop a recipe for my empanadas (there was a spreadsheet involved, but I’ll spare you). Note on potatoes: In Colombia, potatoes are a science unto themselves; there were more varieties of potatoes in the supermarket than I could even begin to wrap my head around. Small potatoes, large potatoes, red potatoes, blue potatoes, purple potatoes; there were even unwashed potatoes with the dirt still on (to be washed at home — some people like them that way). Taking a survey of the entire country would yield even more variety. And all of these potatoes have their specified uses; without a doubt there is some canonical potato for pipián. In the United States though, potatoes is more or less potatoes and we’ve got to take what we can get. I used white potatoes from the Midtown Farmers Market. Hogao is an ingredient in many, many Colombian dishes. 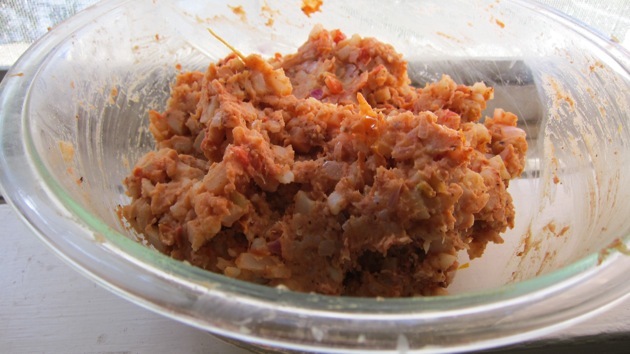 In its simplest form — this is how Stella taught me to make it — it is a mixture of chopped onions and tomatoes, cooked to a puree-like consistency. More complicated versions exist; I personally couldn’t resist throwing in some garlic. I took 356 g roughly chopped tomatoes, mixed them with 156 g roughly chopped onion and 12 g (2 cloves) minced garlic and cooked it to the right consistency: maybe ten minutes over medium heat. This probably leaves authenticity purists even more disturbed than the potatoes, but all the recipes call for roasted and ground peanuts (peanuts being the defining characteristic of Pipián); peanut butter saves several steps. I’m not talking about Jif here — our jar of Salt-Free Eastwind Peanut Butter’s ingredient list reads as follows: “Roasted Peanuts.” But Jif would probably be fine too. To make the Pipián, place the diced potatoes in a saucepan and cover with cold water. Add plenty of salt. Bring to a boil and simmer until the potatoes are just tender; it won’t take long if you’ve diced them small enough. When the potatoes are cooked, drain them well, then mix with the other three ingredients until everything is evenly distributed. With the filling under control, the next step is to make the wrapper. 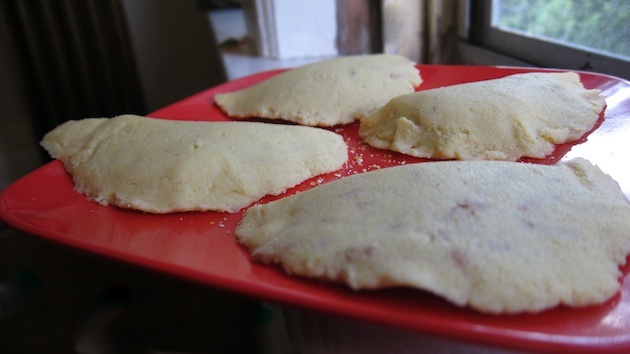 Empanadas de pipián feature a yellow-corn based masa, for which I used the bag of P.A.N. 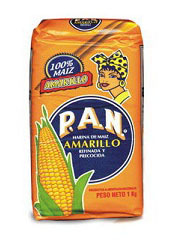 Harina de Maiz Amarilla Precocida that we brought with us from Colombia. At the time we thought it would be impossible to get in the States and that we’d be out of luck if we needed our empanada fix. Happily, I’ve noticed this product available in many Latin American markets and even Latin American sections of supermarkets, so there is no obstacle between you and perfectly crunchy empanadas. I followed the instructions on the package, adding a bit of salt to a cup of water, then stirring in a cup of corn flour. It is important to let the dough rest 15-30 minutes to hydrate fully; the dough will be too wet when it’s first mixed; the water hasn’t been fully absorbed by the corn. When the dough is sufficiently hydrated, it should be divided into balls. I pinched off a ball I thought looked to be the right size and measured it at 34 g; in retrospect these were probably a little too big. But the bigger you make them the fewer empanadas you’ll have to fold together, so it’s worth considering. Anyway, there’s no agreed upon size for empanadas de pipián; in Colombia we sampled some that were little more than folded over tortilla chips, and others that were much more substantial. 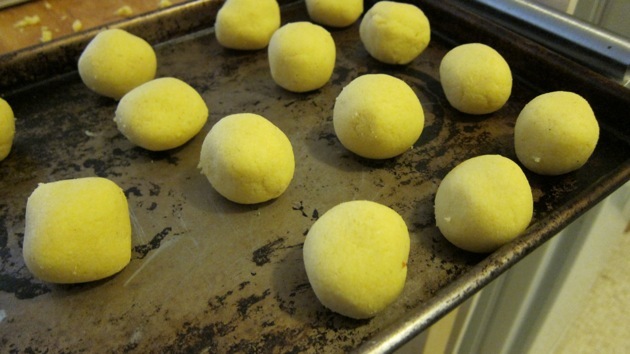 Once you’ve completed your ball size deliberations, you’re ready to form the empanadas. The easiest way to do this is with two sheets of plastic — a zipper-lock bag torn asunder, say. Place one ball between the sheets of plastic, flatten it slightly, then roll it out into an even circle using a rolling pin. Remove the top plastic sheet, place a tablespoon or so of filling in the middle of the dough circle, then fold the bottom plastic sheet over itself to close the empanada, pressing the edges to seal them. Carefully peel back the plastic and flip the empanada onto a cornmealed, floured, cornstarched, or otherwise nonstickified sheet. Continue until you run out of dough, filling, or patience. 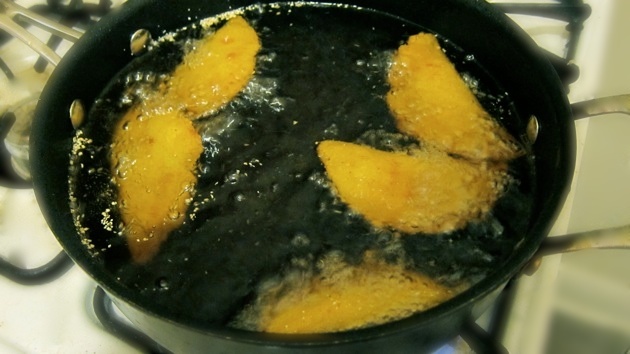 Heat deep frying oil to 350ºF (you’ll have to use your own judgment on how much oil to use; in my pan 2 quarts made sense). Fry the empanadas in batches of 4 or 5. They are done when they start to develop dark brown spots, which should occur just as your oil recovers to 350ºF, ready for the next batch. Let the empanadas cool a little (OR THEY WILL BURN YOUR MOUTH) but not too long — they are best fresh. 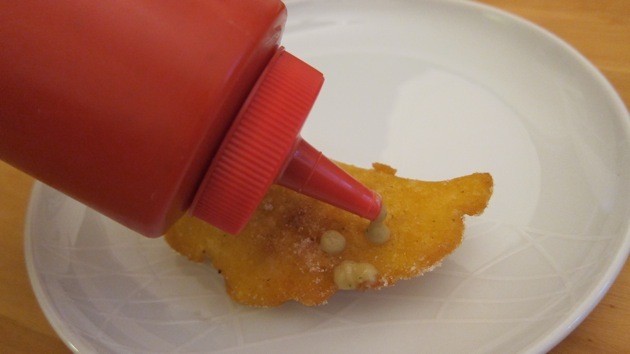 Serve with ají de maní, preferably applied to each bite from a red squeeze bottle. To be honest I wasn’t totally happy with the way this sauce came out; the addition of cilantro (an idea I got from that darn Internet) didn’t do much for the sauce. The basic idea here is a spicy sauce tasting of peanuts with a thin consistency. This entry was posted by Tom on Tuesday, August 3rd, 2010 at 8:05 pm and is filed under Recipes, Technique, Travel. You can subscribe to responses to this entry via RSS. I really appreciate the listing of weights rather than volume. I wanted to go with mass because it is more accurate; it would be best if all recipes used mass. At the same time, for the eyeball cook that doesn’t want to get the scale out masses can be pretty hard to estimate. Despite the best efforts of 16 years of public schooling I really have no concept of how much 100 g is. That’s why I also included volume estimates. For recipes here, if I’m planning to write about it as I’m cooking it’s easy to measure what I use, but if I only decide after the fact and try to remember what I did, you’re more likely to see (often vague) volume measurements. oh! you´re right about the potatoes. You need “papa colorada” to have the pipian right. It is similar to yukon gold, kind of. You might want to try that one next time. Papa Colorada is kind of sweet in taste, yellow inside, and you have to keep the peels, so you need a potatoe with a soft peel. We used to cook pipian with yukon golds while we lived in the US. For flavor we used to cook the potatoes in a pork stock (you can use pork ribs, and then you can deep fry them, they will taste wonderful). That is the way my grandmother used to make it (Stella might have forgotten it ), just one more tip for you.